Living Trusts – James F. Gulecas, P.A. A Living Trust is a trust that you establish during your lifetime. It is also known by such names as a Revocable Trust, an Inter Vivos Trust, and a “Loving” Trust. You serve as the initial Trustee of the Trust and have full management control of the trust assets during your lifetime just as though you owned them individually. During your lifetime, the trust assets are considered as owned by you for income tax purposes, and no trust income tax return is required. In the event of your incapacity, the person or persons that you appoint would take over management of the Trust assets as successor Trustee(s), thereby avoiding the need to appoint a guardian with respect to such assets. Upon your death, the assets held in the Trust will be distributed by the successor Trustee(s) to your beneficiaries or held in trust for them as you direct without being subject to the probate process. It is important to remember that to avoid probate, assets must be titled to the Living Trust during your lifetime. Any assets that you have not titled into the Trust and do not otherwise pass outside of probate will be distributed according to your Will and will be subject to probate. Sadly, we too often see cases where people have invested a lot of money in a Living Trust, but failed to title their assets in the Trust during their lifetime. To prevent this, we give all of our clients detailed instructions on titling assets into their Trusts and will assist in retitling assets on request. 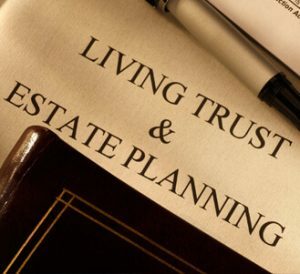 You will see many ads in newspapers for Living Trust seminars that seem to say that you can do estate tax planning in a Living Trust that you cannot do in your Will. That is simply not true. You can avoid estate taxes just as well with a Will as with a Living Trust. What matters is whether the proper estate tax savings provisions are in the Will or Trust. Of course, most people with enough assets to be concerned about estate taxes will also save substantial money by avoiding probate, so the two often go hand-in-hand. In addition, many of these seminars seem to indicate that a Living Trust is the only way to avoid probate. This is also not true. There are many other mechanisms available to avoid probate, including joint tenancy, beneficiary designations and transfers with retained life estates. Each of them has its own benefits and disadvantages. Any property that you own as joint tenants with right of survivorship with anyone, or a tenants by the entireties with your spouse, will pass outright to the surviving co-owner on your death without going through probate. However, there are many possible problems with non-spousal joint tenancies. If you make a child a co-owner and later desire to sell the property, then you will need the child’s consent to do so. In addition, if the child has creditor problems, then the creditor may have the ability to place a lien on and foreclose upon the child’s interest in the property. Not a happy result! Property that you co-own as tenants in common will be subject to probate upon your death. Beneficiary designations have traditionally been available with life insurance, IRA’s and pension plans and bank accounts. In 1994, Florida adopted the Uniform Transfer on Death Securities Registration Act, which permits beneficiary designations on stock and bond certificates and brokerage accounts. You simply name the person or persons you want to receive the property on a beneficiary designation form, and upon your death, the property or insurance proceeds pass outright to the beneficiaries named. So long as you don’t name your estate as beneficiary (a common mistake), probate is avoided. Because beneficiary designations can generally be changed without the beneficiary’s consent, the beneficiary has no rights to the property during your lifetime, so this method is preferable to a joint tenancy. Unfortunately, beneficiary designations are not very flexible, in that you are generally limited to naming specific individuals as beneficiaries, for example, 50% to Child A and 50% to Child B. If Child B predeceases you, then many beneficiary designation forms provide that 100% would pass to Child A, even if Child B has children of his or her own. While other probate techniques are available, a Living Trust is the only probate avoidance device available that permits sophisticated tax planning, flexibility as to disposition, and avoids guardianship, as can be seen from the following chart. *Guardianship may also be avoided with a properly drafted Durable Power of Attorney. Much of the material on this web site is in Adobe Acrobat PDF format. If you don’t already have the free Adobe Acrobat Reader, you may click on the below icon in order to download it.